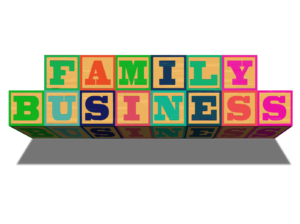 Most family owned businesses are successful because the owners are entrepreneurs that focus on their business with 110 percent of their efforts. But, in the day-to-day grind of running the business, they don’t plan for the future. Studies report that 80 percent of family owned businesses do not pass successfully to the second generation. Of the 20 percent that do, 80 percent don’t transition successfully to the third generation. Why? The owners fail to effectively plan for business succession. What should you be doing to protect your business and family in the event you are in an accident tonight? 1. Identify the key people who have the skills to run your business. These employees or family members may know how to operate the business in the short-term, but what about the long-term? The time to make a plan is now. What are the top five things you want them to know for the long-term success of your business? Make a list and discuss it with them. If you are uncomfortable sharing the information, put the list in a place where they will easily find it after your death. Commit to reviewing and updating the list annually. Consider involving these key people as minority owners now by transferring ownership interests to them via gift, sale, or as employee compensation. This will provide motivation for them while you retain control of your business. 2. Get a buy-sell agreement in place for your business. Upon the occurrence of certain events (such as termination of employment, death, etc. ), this critical agreement provides that the ownership interest may be purchased by the other owners or the business. For example, if you terminate an employee who owns a minority interest, the agreement provides that the employee must sell his interest to the other owners or the business. The agreement will fix the purchase price (or provide a formula for determining the price) and specify when it will be paid. Review the purchase price annually to make sure it will be fair to all parties. If you die and your spouse survives, will your spouse have enough nonbusiness income to live on? If not, then you need to ensure your spouse receives income from the business. For example, if you own the real estate on which your business operates, it could be owned by an entity separate from your business. A limited liability company (LLC) is often used to own real estate as it provides creditor protection and the pass-through of income for tax purposes. Your LLC can enter into a long-term lease that specifies a fair rental amount for your business to pay to the LLC. You can leave your LLC interest to your spouse so your spouse will receive the monthly rent. You could provide in your buy-sell agreement that your ownership interest must be purchased at your death. Then, your spouse will have these funds available for support. If you wish your children to own the business after your death, they can become minority owners now and after your interest is purchased at your death, they will become majority owners. They can purchase your interest using insurance proceeds and/or making installment payments on a promissory note using the business income. 3. Decide how the inheritance will work. Owners often want to leave assets equally to their children, yet only some of them work in the business. If your assets are divided equally among your children, will those working in the business be able to receive your ownership interest as part of their share? If not, there are several alternatives. You may prefer to divide your assets “equitably” rather than equally and thereby acknowledge that your children working in the business have helped the business grow. Thus, distributing the business assets to them would be fair even though it may be more than an equal share. You could leave the LLC owning the business real estate to your children who do not work in the business while leaving your business ownership to those who work in the business. 4. Don’t forget tax planning. Meet with your team (accountant and tax attorney) to plan how to structure this while minimizing income and estate taxes. Don’t delay, with some planning you can ensure your business is one of the few that does survive to the next generation. Not only will you have peace of mind for your family, you’ll have taken the preemptive steps to make your business succession a success. Cindy McClannahan chairs the Estate Planning, Business Succession, Planning, Probate and Trust practice at Seigfreid Bingham, P.C. *This article is general and nature and should not constitute legal advice. Readers with legal questions should consult with an attorney prior to making any legal decisions.